Born at Lubwa Mission Station in 1924 as one of eight children, his father, Reverend David Kaunda of the Church of Scotland endowed in him the gift of love not only for his close family members but all races. His parents also taught him to read at an early age such that by the time he started school at Munali in Lusaka, young Kaunda was ahead of his peers. After Munali where he got a teaching certificate, young Kaunda took up a teaching post at Chinsali Mission when winds of change driven by the late Dr Banda and another Zambian nationalist leader Harry Nkumbula were rising against the Federation of Southern Africa. At 25, Kaunda took up the campaign holding solo guitar sessions across Zambia (then Northern Rhodesia) singing freedom songs and created branches for the African National Congress. His efforts earned him the secretary general’s position and a prison booking in Lusaka. While in prison, Kaunda formulated humanism, a concept that expresses faith in the common men and women as well as a belief in non-violence. Looking back today, this concept made him feel the pain others under the yoke of oppression felt. He then left ANC to form the Zambian African National Congress that was driven underground by the British who arrested and brought him to Salisbury (Harare) Prison. When he left Salisbury Prison, he founded the United National Independent Party (UNIP) that joined hands with Dr Banda’s Congress Party to fight the federation. In 1962, he became a legislative Council of Northern Rhodesia as a Minister of Local Government and Social Welfare in a UNIP/ ANC coalition government. He assumed the presidency of the Republic of Zambia in 1964. Of course, it’s a fact that he lost the 1991 election to Chiluba because the Zambian economy was bartered and the nation was wallowing in poverty. Unlike Mobutu Sese Seko of Zaire and many other African leaders who drive their economies into the ground because of greed and insensitivity, Kaunda was a victim of many things. But before looking into the machinisations formulated to effect his downfall, it would help a lot to list down what he did for Zambia. When he took over, enrolment in schools and colleges rose from 3million to 7million and infrastructure such as roads, clinics and colleges were built. He introduced the National Development Plans from 1964 to 1970 under which his reconstruction plans were carried out. But just like any other African nation, Zambia was a welfare nation. This state of affairs is usually a result of trying to cater for previously marginalised people. So in the early days of independence, Zambians enjoyed state subsidies on maize meal and other products. This, however, backfired when the copper prices fell such that by 1986, the economy could not hold. The International Monetary Fund (IMF) had advised Zambia to devalue the kwacha, freeze wages and control public expenditure. The ripple effect of this was price hikes and massive shortages of commodities. By 1987, it was clear that Zambia was drowning and Dr Kaunda cut ties with both IMF and World Bank. What many people seem to forget is what caused the decline in Zambia’s economy. Most attribute it to Kaunda’s mismanagement yet there were various factors. To begin with, when Ian Smith declared the Unilateral Declaration of Independence in 1965, he cut off the shortest route for the transportation of copper to South Africa from Zambia because ZAPU and ZANU, organisations fighting Smith were sheltered by Kaunda. This was costly for the country. With no help from the international community, Kaunda had to team up with Julius Nyerere and the Chinese in constructing the 1860 km Tanzania Zambia Railway (Tazara). A 1710km pipeline, the Tanzania, Zambia and Malawi (Tazama) that stretched from Dar es Salaam to Kapiri Mposhi was built. More hydro electricity stations were built at the Kafue Gorge and Kariba’s North Bank while industries were established to withstand the liberation struggle with farming systems improved to boost local food production. In a 2001 report titled Zambia Against Apartheid compiled by and the Justice Centre for Theological Reflection (JCTR) estimates the cost of southern Africa’s war on Zambia at US$19billion. Of this figure, US$5,34billion was incurred fighting apartheid alone. The report notes that 2010 figures ‘should be higher’. “Support for liberation of Zimbabwe and others contributed to Zambia going into debt and through harsh IMF and World Bank debt conditions, staying in debt. “And some forces that for gain supported racist regimes have come through other windows and are getting facilities and resources built by Zambia during the liberation. “In April 1994, when apartheid South Africa changed and Nelson Mandela became president, Africa's liberation sights were reached. But for Zambia, there were no organised international or local processes of healing from Southern Africa's war of liberation,” the report further says. Although the fight against racism was a task for human dignity, the reports says, there has been no international material and economic support to help Zambia's rehabilitation. Thus various imbalances continue in society. Apart from the economic effects the wars caused on Zambia, the report says Zambia had to increase spending on defence and security because of ‘bombings by racist regimes led to thousands of deaths of Zambians and freedom fighters. Many were maimed’. Despite all these sacrifices, Dr Kaunda’s legacy is not fully recognised and it’s saddening that when he was admitted in a Namibian hospital, the leaders he helped ascend to power were gathering in Windhoek discussing the future of liberation war movements. They also gathered in Luanda, Angola for the Southern African Development Community (Sadc)’s chairmanship handover for an organisation he was the first chairman. If we go back again to the Mandela/ Kaunda parallel, one would ask: What is the difference between the two? Why has not the west been good to Dr Kaunda for bringing freedom to the region just like they are good to Mandela? Who is a better statesman – one who fights for others’ freedom and one who does not condemn democracy’s undemocratic ways? If it’s for peace, during his entire rule, Dr Kaunda never called for violence. It was his paramount desire to inculcate peace hence the peace that prevails among tribes in Zambia today. If it’s fighting for HIV/ Aids, Dr Kaunda has done much for this cause through his Kenneth Kaunda Children of Africa Foundation. Like Mandela, Dr Kaunda is respected in his country where he lives like an ordinary citizen. 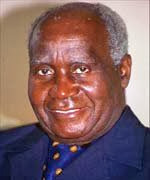 While the west can be justified in dumping Dr Kaunda in the dustbin of history, what about the region he helped free? It appears as if time and history are drowning Dr Kaunda’s voice calling for togetherness and understanding among all the peoples of the region. With time, we won’t hear his signature tune: Tiyende Pamodzi Ndi Mutima Umo!